The fifth card of the Major Arcana, the Hierophant (V) often portends a religious ceremony like a wedding, baptism, bar mitzvah, or funeral. Sometimes referred to as “the Pope” or “the High Priest,” it represents authority, convention, and a commitment to following a strict orthodox lifestyle. In the Rider-Waite deck the Hierophant is depicted as a religious figure, a Pope or High Priest, positioned in a formal church-like setting. As such he symbolizes organization, institution and spiritual guidance, while his three vestments stand for purity, immortality and ritual. His right hand is raised in an act of benediction while in his left he carries a triple cross, traditionally associated with Catholicism and the Pope, with the three horizontal bars of the cross representing the Father, the Son and the Holy Ghost. He wears an elaborate gold crown in reference to the Pope’s three titles and primary functions: supreme pastor, supreme teacher, and supreme priest. The three nails projecting from the top of this crown are representative of Jesus Christ’s personal sacrifice and crucifixion. Two acolytes are seated before him, signifying the transfer of the sacred knowledge found in scripture within institutions. People denoted by the Hierophant tend to be seekers, always searching for the meaning of life in general, and the purpose of their own lives in particular. They typically make for great, loyal friends. When you call on them for specific advice or help with some important personal matter, their intelligence and intrinsic empathy puts them in a position to provide tremendous support. 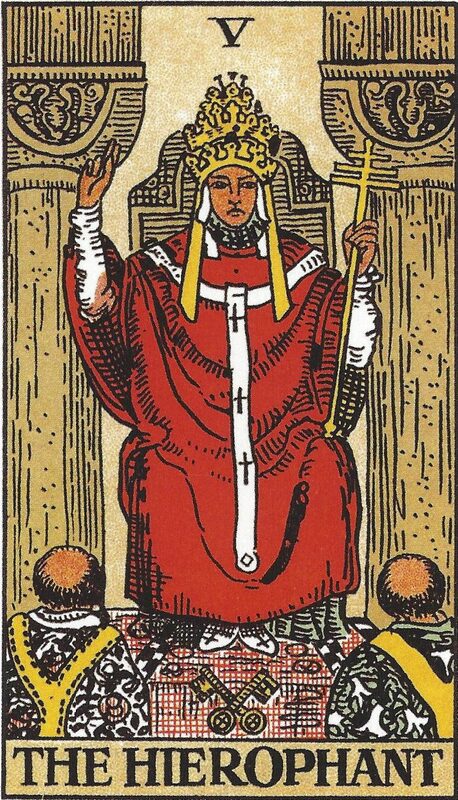 Quick-witted, well-educated, and wise teachers themselves, while sometimes gently iconoclastic, people represented by the Hierophant are marked by their integrity. Quite simply, they are the genuine article — highly admired individuals who walk the walk and stand firm in their beliefs and convictions. 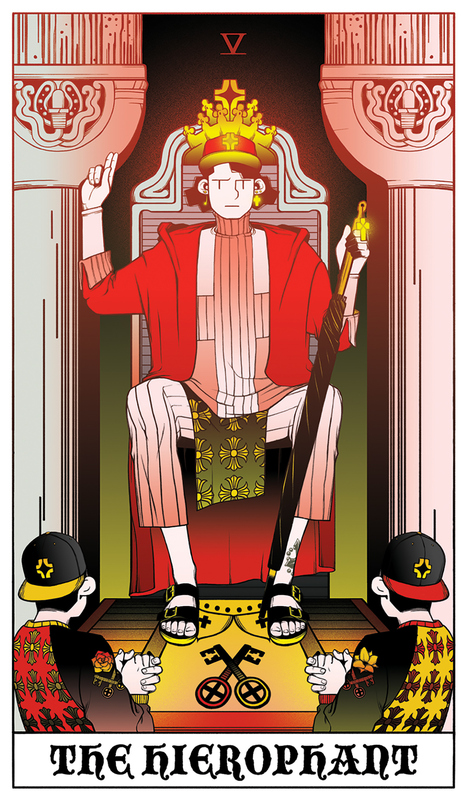 The card of traditional values and institutions, the Hierophant is all about doing the right thing such as it is perceived by your inner being. The Hierophant is very tied to spirituality, the innate wisdom we all possess, and by extension our connection to the universe or a higher power. The religious aspect the Hierophant signifies is broadly defined, and runs the gamut from Islam to Judaism to Christianity to worshiping extra-terrestrial beings. As such, your idea of “the right thing” could be notably different from what others believe it to be. However, when confronted you need to be firm and stand up for your beliefs. When the Hierophant appears in a spread it should be taken as a warning that this is not the time to break from tradition, but rather to stick with the tried and true that has served you very well to date. Conformity is the name of the game right now, as is honoring ritual. For instance, if you typically go to church every Sunday morning, now isn’t the time to stop or begin altering your routine. The more conservative the ritual, the more crucial it is that you don’t stray from the pack — especially if it involves respecting broader societal norms. If you are looking for a traditional relationship as defined by the society you live in, finding this card in a love reading is a positive sign. In this context the Hierophant only means good things. If you’re single, somebody you’ve been attracted to for a long time but has always seemed out of reach romantically may have developed an interest in you. If you’re already in a good relationship, you can expect it to only get better as time moves along. You are about to enter into a new phase of your career, be that the culmination of your current employment, a promotion, or possible transfer to a new geographical location. You will be working with new people, and one of them will emerge as a mentor of sorts, something you’ve needed for a long time but may not have realized. No matter the job you’re presently performing or will soon be engaged in, don’t rock the boat at work, stay organised, efficient, and follow all the rules as they’ve been laid out for you. The Hierophant is warning you not to make any questionable purchases or put money into any risky investments right now. Conservative is the name of the game here. Follow all the conventional wisdom when it comes to money: don’t spend more than you earn, put something aside every month for a rainy day, don’t let the balance on your credit cards climb too high, and be smart and cautious with the resources you do have. Your health is just fine, but that doesn’t mean you couldn’t eat a little better and start exercising regularly again. Ritual is helpful at this time, so if you eat a healthy breakfast every morning at 8am sharp, don’t wait until 8:30am on some days or skip it altogether. If you always take the stairs instead of the escalator when given the opportunity, don’t suddenly decide not to now. Finally, if you do start to feel any ailment coming on, be it a simple cold or something slightly more serious, stick to conventional medicine. This isn’t the right time to start experimenting with alternative therapies, regardless of how safe or efficient they may be. In reverse, the Hierophant could indicate that you’ve been ignoring your spirituality to the point where it is negatively affecting you. You may also feel as though you’re somewhat alone in the world, that others simply don’t understand you and are questioning your course of action because of it. This is upsetting, but you need to recognize that people simply disagree with one another sometimes and that it’s not a reflection of how they feel about you personally. If you’ve made a decision you feel strongly about, stick with it and don’t worry about what other people think. You haven’t lost control of your life, but you need to stay vigilant or else people will start chipping away at your autonomy. When the reversed Hierophant appears in a love reading it suggests that you are starting to grow bored and are longing for stimulation. This desire for stimulation may result in your looking for it elsewhere — with all that this entails. You need to address this need and consider your circumstances and the options available to you. While your relationship may be in a bit of a lull at the moment, there is still love there, so you will want to tread carefully lest you do something that causes irreparable harm and effectively ends it when that might not be what you truly want. In the context of a career reading, the Hierophant might be telling you that you need to conform to the new reality of your work situation. You might have a new boss who is unreasonably demanding, in possession of a singularly unpleasant disposition and unwilling or unable to accept compromise, regardless of whether it’s for the good of the project or issue at hand. As much as you might want to resist this individual’s demands, save it for another day, as right now it’s all about conformity. Straying into rebel territory will only work against you. As with the upright interpretation of this card, the reversed Hierophant in a money reading is warning you to be conservative with your spending right now. This doesn’t mean you should necessarily stay away from investing — in fact, it could actually be an excellent time for it, but stick to the blue chip, stable, conservative variety or you run the risk of being very sorry a little down the road. If you’ve been dealing with any long-standing health challenges it might be a good time to think about trying a different approach towards treating them. If you’ve ever wondered about TCM or other alternative therapies, this is a good time to investigate them on a practical level. Any minor changes you make to your health regimen now could result in some major improvements to your condition. Don’t abandon your present treatments altogether, but massage, acupuncture, aromatherapy, and any number of alternative therapeutic approaches should be worthy of your consideration. In the past position, the Hierophant indicates that you’ve benefited more than you realize from your past ambitions, whether they were realized at the time or not. Determine where this strength within you lies, and apply it to your benefit under your present circumstances. As an indicator of your present situation, the Hierophant represents a new way of living and belief system that could be taking a hold and motivating you in a positive manner. However, you need to move slowly and carefully, don’t dive into any new venture without first giving it your full consideration. In the future position this card is suggesting that you don’t need to do anything special to plan for your future right now. Everything is as it should be and will organically unfold in a positive fashion. The Heirophant card represents traditions, in particular religious ceremonies like weddings. Take note of which cards are nearest to the Heirophant, as they can denote, on a deep spiritual level, what is truly most important to you. The Hierophant with the Five of Cups signifies a lost sense of self and diminishing self-respect. The Hierophant with the Lovers card is a sure-fire sign that you’ll soon be attending a wedding, which might even be your own. The Hierophant in a spread with the Five of Swords indicates that you are joining a certain group or movement, be it cultural or political, which could threaten your relationships with friends and family.